Deep within the recesses of the Disney vaults, one will find an animated short-film of a different nature; a film that many people aren’t even aware exists. Short cartoons produced by the Disney Studio in the 1950’s were being made on a limited budget. In reality, shorts were not that cheap to make at all, and the money that the studio made, or could obtain at the time, was mostly being used to build and expand Walt’s new dream – Disneyland. Recycled animated shorts were still prominent on his weekly television series, but as the 1950’s came to an end, theatrical shorts were sadly becoming a thing of the past; bidding farewell to the likes of Goofy, Donald Duck, and even Mickey Mouse. Despite all this, Disney took no liberties dabbling in abstract art and limited animation, and even began incorporating stop-motion techniques into a special line of shorts. Stop-motion animation is one of the oldest forms of animation. The earliest stop-motion animators used a motion-picture camera that could shoot a puppet or an object one frame at a time, making small animation adjustments for each frame. When played back at twenty-four frames per second, the puppet would appear to come to life. Those figures could be manipulated under the camera, their position changing each time a frame of film was shot – an arm could be raised frame by frame, say – so that when the film was projected the figure seemed to move. Nearly seventeen years after Disney’s experimentation with those “crude little things”, he had already become a household name. After the success brought on by his lifelong “partner” Mickey Mouse in 1928, and the creation of the “Silly Symphonies” musical cartoons shortly thereafter, 1937 would yet again be another year when Walt Disney brought animation to new heights with the first animated feature – Snow White and the Seven Dwarfs. 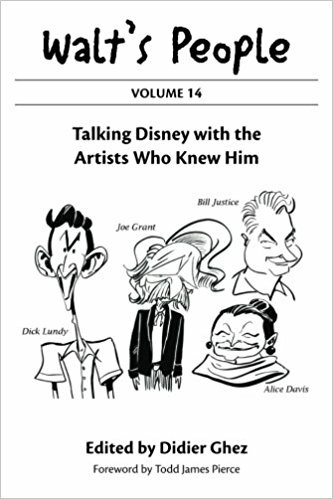 As this Golden Age of Disney animation was just beginning, so too was the career of a young animator named Bill Justice. July 17, 1937 was my first day at Disney. I showed up wearing my best suit and that was a mistake. I wanted to make a good impression. Los Angeles was very, very hot and there was no air conditioning at the Hyperion Studio so the other guys looked at me like I was a hick. The next day I dressed more comfortably. Even though Justice didn’t realize it at the time, his work would go on to leave a very lasting impression on the world of Disney animation. He not only served as animator on Fantasia (1940), Bambi (1942), Alice in Wonderland (1951), and Peter Pan (1953) (to name a few), but also developed some of Disney’s most lovable characters like Thumper and Chip and Dale. The 1950’s brought the opportunity for Bill Justice to try his hand at directing, and one of his greatest directorial attempts serves as the centerpiece of this post. One year after Justice joined the Disney Studio, another youth signed on with Walt Disney’s elite. Francis Xavier Atencio (better known as X) began his Disney career as an inbetweener and then clean-up man for legendary animator, Woolie Reitherman. His first assignments with Reitherman included Monstro the Whale for Pinocchio (1940) and Timothy Mouse in Dumbo (1941). Just as Atencio was beginning to stretch his legs at Disney, World War II whisked him away. “And then, after the war,” recalled Atencio, “I came back and I had to start all over again at the Studio.” Starting from scratch could not have been easy for Atencio, but his patience would pay off in 1953 when he received his first screen credit for his animation on Toot, Whistle, Plunk, and Boom. 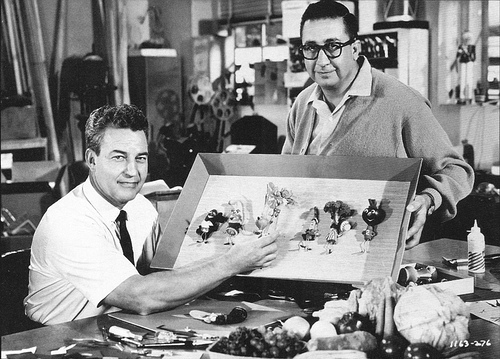 Shortly thereafter, history would be made at the Disney Studio again when X. Atencio and Bill Justice crossed paths professionally to create Noah’s Ark in 1959. It would be foolish not to mention the contributions of Disney artist T. Hee where Noah’s Ark is concerned. T. (Thornton) Hee began his career the same year as Atencio at the Disney Studio; largely thanks to his impressive ability at drawing caricatures of Hollywood celebrities of the time. 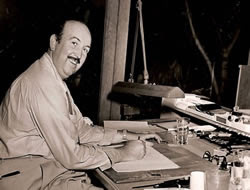 Within his Disney portfolio, one will find that Hee served as director on the Honest John and Gideon sequences in Pinocchio, co-directed The Dance of the Hours segment in Fantasia with Norm Ferguson, worked on the titles for The Reluctant Dragon (1941), and adapted and developed story elements for Victory Through Air Power (1943) and Make Mine Music (1946). Twelve years after leaving the Disney Studio in 1946 to write and design for UPA , he returned just in time to collaborate with Bill Justice and X. Atencio on Disney’s Noah’s Ark; the studio’s first stop-motion animated film. The story T. Hee tells of the development of Noah’s Ark in an interview with Richard Hubler is enjoyable from beginning to end. Around 1958, Walt Disney was throwing around the idea of doing a three-dimensional short entitled A Rag, A Bone, A Hank of Hair. Hee recounts Disney saying to Justice and Atencio: “Look, Tee makes things out of spoons, ice-cream spoons, and screwdrivers and nuts and bolts and everything. Let’s get him in.” Hee’s encounters with Disney make for great conversation, simply because the two at times never saw eye to eye. In fact, Hee wasn’t particularly interested in Disney’s idea of doing A Rag, A Bone, A Hank of Hair, and had something else up his sleeve. The only thing left to do – sell his new idea to Walt Disney. With Bill Justice serving as director and stop-motion animator, along with X. Atencio, and story development by T. Hee, Noah’s Ark went on to become a rather delightful little film. From beginning to end, I am totally floored by Justice and Atencio’s stop-motion techniques. After the impressive animated credits are complete (introduced by a pair of hands perhaps belonging to Justice or Atencio themselves) a revolving Earth is revealed among a bluely-lit background, and our main characters enter the picture. Noah, his brothers and wife, and the animals of the Ark are unlike anything ever seen before in the world of animation. Every household item you could think of was used to create the body structures of all the characters, from toothpicks to erasers, spools of thread to pipe-cleaners, eggs to sporks, and clothespins to corks (just to name a few). The storyline follows that of the Bible, and from the moment God’s voice emits from a pink cloud above, the building of the Ark - and the film’s highlights - begin. The plot of the short is very enjoyable, and one cannot deny that the stop-motion animation is truly the backbone of it all. Jerome Courtland’s narration and singing is particularly fitting throughout, and the underlying message regarding procreation (“the families grew larger somehow”) within the music is amusing. Considering the daunting and tedious task of bringing the animals on the Ark to life, Bill Justice and X. Atencio cut no corners; adding fine detail to everything from the straining chair legs beneath Mrs. Hippo to the flamingo couple lovingly knotting their necks. It’s easy to see how a short film of this magnitude was nominated for an Academy Award at the time. As the 1950’s wrapped up for Disney, the 1960’s soon brought some more of Justice and Atencio’s elaborate stop-motion work – appearing in such live-action films as The Parent Trap (1961), Babes in Toyland (1961), and Mary Poppins (1964). 1962’s A Symposium on Popular Songs, however, would be the last time the two would work on an animated short together – combining the wit and egocentricities of Ludwig Von Drake (voiced by the incomparable Paul Frees) and the music of Richard and Robert Sherman. This short is not only a treat to watch and worthy of a posting itself, but it too showcases some of the greatest stop-motion animation ever produced; earning the studio another Academy Award nomination. As we watch the stop-motion animated films of the last quarter century, from The Nightmare Before Christmas (1993) to Fantastic Mr. Fox (2009), we mustn’t forget the pioneers who helped revolutionize this artistic and time-consuming craft. “When I got into stop-motion stuff,” Bill Justice once explained. “It was the hardest work I had ever done in my life.” Noah may have built the Ark, but Bill Justice and X. Atencio brought it to life. Watch Noah's Ark below for yourself!